Has your company worked with FLEXcon before? Yes, my company is currently doing business with FLEXcon. No, my company has not conducted any prior business with FLEXcon and we are a new customer. I don't know. I am not certain what my company's relationship with FLEXcon is. Our online store is limited to companies located in the U.S.
Not sure if you are a FLEXcon customer? Contact Information not an existing company? Create Password more info Password Required weak Must be 6 or more characters & have 1 or more numbers. Contact Information not a new company? Create Password more info Password Required weak Must be 6 or more characters and contain at least 1 number. 8AM EST to 5PM EST. If you would like to use a preferred first name other than the one you entered, enter it as your nick name (not required). Password must be at least 6 characters and contain 1 or more numbers. These Standard Terms and Conditions of Sale (the “Terms”) shall apply to all sales and contracts for the sale of goods and/or services (“Products”) by and between the FLEXcon legal entity (“FLEXcon”) making the sale as identified on FLEXcon’s purchase order acknowledgement (the “Acknowledgement”) and any customer (“Buyer”). Buyer’s acknowledgement, commencement of performance or any other conduct by which Buyer recognizes the existence of a contract pertaining to the subject matter hereof shall constitute acceptance by Buyer of these Terms. Additional or different terms provided in Buyer’s acceptance of FLEXcon’s offer which vary in any degree from any of the Terms shall be deemed material and are hereby objected to by FLEXcon without further need of objection. Any such proposed terms shall be void, of no effect and not in any circumstances binding upon FLEXcon. These Terms together with information contained in FLEXcon's Acknowledgment and/or invoice shall constitute the entire agreement and understanding of FLEXcon and Buyer with respect to the purchase and sale of Products, superseding all prior oral or written understandings relating thereto. FLEXcon may at any time, by written notice to Buyer, make changes, including but not limited to drawings designs, processes, specifications, mode of shipment, packing, time and/or place for delivery, quantity, acceleration, sequencing, or the general scope of work for the Products specified in the Acknowledgement and to direct temporary suspension or resumption of the scheduled shipments. If any such change causes a material increase or decrease in the cost to Buyer or the time required for performance, then an equitable adjustment shall be made in the price or delivery schedule or both and the Acknowledgement shall be modified accordingly. Unless otherwise stated on FLEXcon's Acknowledgment and/or invoice, Buyer shall pay all amounts due for Products purchased from FLEXcon in U.S. Dollars within thirty (30) days from the date of FLEXcon's invoice. Notwithstanding the foregoing, in the event FLEXcon deems in its sole discretion Buyer's financial status unsatisfactory or Buyer is in default of any obligation to FLEXcon, FLEXcon (without prejudice to any other rights or remedies it may have) may require payment in full in cash of all amounts payable to FLEXcon prior to shipment of any Products thereunder. Buyer shall pay an additional interest and service charge in the amount indicated on FLEXcon's then current applicable price list or, if none is so indicated, in an amount equal to one and one-half percent (1.5%) of the unpaid balance per month (or portion thereof), or if less, at the highest interest rate permitted by applicable law, accruing from the applicable due date. Buyer shall not withhold or set off from any amounts due to FLEXcon, any amounts claimed to be owed by FLEXcon to Buyer for any reason whatsoever and, if any withholding is required by law, then Buyer shall increase the amount to be paid to FLEXcon so that it receives the same net amount after such withholding. Each shipment shall be separately invoiced and paid for when due without regard to other shipments and no set offs or claims shall be made relating to any other shipments. Unless otherwise expressly indicated in writing by FLEXcon, prices for standard or quick-ship Products are as noted on FLEXcon's price list as in effect on date of shipment. Prices for custom and/or special stock Products will be quoted upon request. All prices are based on quantity indicated and, unless otherwise indicated on FLEXcon's Acknowledgment and/or invoice, are EX-WORKS (EXW) the location of FLEXcon's facility from which Products are shipped. Unless otherwise expressly indicated on FLEXcon's Acknowledgment and/or invoice, Buyer shall pay, and be exclusively liable for, all costs of shipping, delivery, insurance and the like after FLEXcon has made delivery of the Products to the carrier to be designated by Buyer. Any and all dies, tools or other equipment used to produce Products shall remain FLEXcon's exclusive property, notwithstanding any charges relating to such dies, tools and other equipment reflected on FLEXcon's invoice. Prices do not include any tax or other governmental charge or assessment on the sale, shipment, production or use of any Products sold to Buyers. Such taxes and charges, when applicable, may appear as separate additional charges on FLEXcon's invoice. Buyer shall be solely responsible for, and shall pay to FLEXcon upon demand, any such tax, charge or assessment, unless Buyer has furnished to FLEXcon an appropriate valid certificate of exemption issued by or acceptable to the tax authority in question. If taxes are in the form of withholding, Buyer shall pay an amount to FLEXcon equal to the invoice price increased for any such withholding so that FLEXcon receives the same net amount after such withholding. Unless otherwise indicated on FLEXcon's Acknowledgment and/or invoice, FLEXcon reserves the right to ship and invoice plus or minus ten percent (10%) of the total quantity of each Product ordered by Buyer. Buyer acknowledges the exclusive ownership, right, title and interest in and to all of the trademarks, as well as all other patents, copyrights and intellectual property (in each case whether or not registered) owned or held by FLEXcon with respect to the Products. Nothing herein is intended to transfer any ownership, rights, title or interest in the intellectual properties of FLEXcon to Buyer or to grant to Buyer any license or right to use such intellectual properties. Buyer represents and warrants that any and all materials, other products or items furnished by or on behalf of Buyer (“Buyer Materials”) to FLEXcon for use in connection with production of FLEXcon's Products will be Buyer's exclusive property, free and clear of all liens, claims and encumbrances whatsoever. Unless otherwise indicated on FLEXcon's Acknowledgment and/or invoice, Buyer shall bear all costs of delivering such Buyer Materials to FLEXcon's production facility. FLEXcon shall only be liable for loss, destruction, or damage to any such Buyer Materials while in FLEXcon's possession to the extent (but only to the extent) caused solely by FLEXcon's gross negligence, and provided that any such liability shall be subject to the terms and conditions contained herein, including, without limitation, all disclaimers and limitations of liability. In addition, Buyer acknowledges that waste in processing Buyer Materials of up to 10% is customary and Seller shall not be liable therefor. 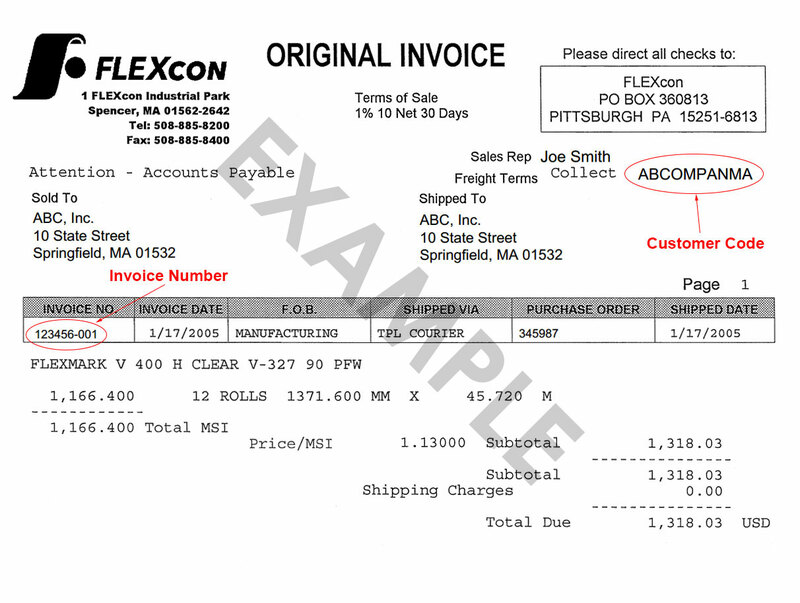 FLEXcon shall make reasonable efforts to effect shipment on or before the scheduled shipping date(s) reflected on FLEXcon's acknowledgment and/or invoice, but such schedule may vary due to, among other things, FLEXcon’s assessment of priority or conditions beyond FLEXcon's reasonable control, including, but not limited to FLEXcon's receipt of all Buyer Materials. If no shipping date is specified, shipment will be made on date(s) selected by FLEXcon in its sole discretion. In no event shall FLEXcon be liable for any damages or penalties for delay in delivery or for failure to give notice of delay. Delivery may be made in advance of any scheduled delivery date upon reasonable prior notice to Buyer. Unless a preferred packing method is expressly noted on FLEXcon's Acknowledgment and/or invoice, all Products will be packed for shipment in accordance with FLEXcon's standard practices. Unless otherwise specified on FLEXcon's Acknowledgment and/or invoice, FLEXcon will package and ship by the most appropriate method, but by doing so does not assume any liability in connection with the packaging or shipment. Any and all claims by Buyer for damage or loss of Products in transit shall be made by Buyer solely against the carrier. If requested by Buyer, transportation charges and insurance will be prepaid and will be added to the invoice as a separate item. Title to all Products sold by FLEXcon to Buyer shall pass from FLEXcon to Buyer when such Products are delivered by FLEXcon at the FLEXcon facility; however, if Buyer should fail to pay when due any amount Buyer owes to FLEXcon on account of such Products, FLEXcon shall have, in addition to any other rights of FLEXcon, the right (without liability of FLEXcon) to repossess such Products or to require Buyer to effect (at Buyer's expense) return delivery of such Products to FLEXcon. In addition, until Buyer has paid to FLEXcon the entire amount due to FLEXcon for such Products, FLEXcon shall retain a security interest in such Products in the amount of the full purchase price plus all other amounts due for the Products and all costs of collection incurred by FLEXcon (including but not limited to court costs and attorneys' fees), and FLEXcon shall retain all rights and remedies of a secured party under the Uniform Commercial Code as in effect at the time of delivery of such Products. A copy of FLEXcon's invoice may be filed with the appropriate authorities at any time as a financing statement or chattel mortgage in order to perfect FLEXcon's security interest. Upon the request of FLEXcon, Buyer hereby provides FLEXcon with a power of attorney to execute on its behalf (or if prohibited by law Buyer shall execute) any financing statements and other documents or instruments necessary or appropriate in order for FLEXcon to perfect its security interest. All risk of loss of or damage to such Products shall pass to Buyer upon FLEXcon's delivery of such Products at the FLEXcon facility. Any and all claims by Buyer for damage, loss or delays in transit shall be made by Buyer solely against the carrier (with notice thereof to FLEXcon), and FLEXcon shall have no responsibility or obligations with respect to any such damage, loss or delay. Buyer shall carefully inspect all deliveries of Products as they are received by Buyer and report to FLEXcon promptly (but in any event within thirty (30) calendar days after receipt of shipment) any alleged error, shortage, defect or nonconformity of such Products. Any failure by Buyer to so inspect and report shall constitute a waiver by Buyer of any claim or right of Buyer against FLEXcon arising with respect to any such error, shortage, defect, or nonconformity. Cancellation by Buyer of any purchase order accepted by FLEXcon cannot be effected except on terms which are acceptable to FLEXcon in its sole discretion and where Buyer agrees to indemnify FLEXcon from any and all loss, damage, cost, or expense caused by said cancellation, including, without limitation, payment of (a) the full price of any custom or special stock Products or (b) a restocking fee equal to twenty-five percent (25%) of the full price of any standard or quick-ship Products, such “full price” being the price set forth on the applicable Acknowledgement. FLEXcon reserves the right to discontinue any Products at any time for any reason and reserves the right to cancel any accepted but unexecuted purchase order for any such discontinued Products. Authorization to return Products purchased from FLEXcon must be obtained from FLEXcon prior to any such return. In FLEXcon's sole discretion, credit may be granted with respect to returned Products, less an appropriate restocking charge, depending on the reason for the return and the condition of the Product. Any returned Products must be shipped to FLEXcon, freight prepaid, at Buyer's sole expense and risk. In the event that FLEXcon is required to recall, or on its own initiative recalls, any of the Products, Buyer shall assist FLEXcon in such a recall. It is the sole and exclusive responsibility of Buyer to determine the suitability of any and all Products of FLEXcon for Buyer's intended purposes and uses, with Buyer agreeing that any information or other communication from FLEXcon as to suitability is merely advisory and not to be relied upon in making said determination. If the Products are “experimental” as hereinafter defined, then Buyer acknowledges that such Products are sold on as “as is, where is” basis and FLEXcon disclaims any and all representations and warranties with respect to any such experimental Products. Buyer agrees that the Products are experimental (a) if the Acknowledgement, invoice, or the Product identifies them as “experimental,” (b) the Product nomenclature contains a material component using an “EX” or “DE” or (c) the Products are or should be understood to be experimental based on other communications with FLEXcon. If the Products are non-experimental, FLEXcon warrants that the Products sold: (i) conform to any specification that is expressly identified in writing as a limited warranty for such Product and signed by a duly authorized representative of FLEXcon (subject to standard tolerances for variations); and (ii) are free from defects in materials and workmanship, provided that, FLEXcon shall not have any liability whatsoever for any damage to or defect in Products or other failure to meet the above limited warranty resulting directly or indirectly from (A) events occurring after the delivery of such Products to carrier by FLEXcon, (B) Buyer’s Materials, (C) Buyer’s failure to properly handle and store the Products in accordance with FLEXcon’s storage requirements, (D) use of the Products in combination with other products or processes not furnished or specified by FLEXcon, (E) additions, enhancements or modifications to the Products by someone other than FLEXcon or not in accordance with FLEXcon’s instructions, (F) Buyer’s misuse of the Products, or (G) the negligence or willful misconduct of Buyer. Liability of FLEXcon under or in connection with the sale of its Products shall be limited to, at the sole option of FLEXcon, either refund of the purchase price of, or replacement of, any Product (I) with respect to which Buyer notifies FLEXcon of Buyer's claim of any alleged defect or nonconformity in the Products promptly after delivery (and in any event within thirty (30) calendar days after receipt by Buyer) of the Products, (II) which is returned to FLEXcon promptly upon request and (III) which is determined by FLEXcon in its sole discretion to be defective or nonconforming. The foregoing is Buyer’s sole and exclusive remedy for breach of the limited warranty set forth above by FLEXcon. THIS LIMITED WARRANTY IS THE SOLE AND EXCLUSIVE WARRANTY GIVEN BY FLEXCON WITH RESPECT TO PRODUCTS SOLD OR PROVIDED BY FLEXCON. FLEXCON GIVES AND MAKES NO REPRESENTATION OR WARRANTY OF ANY KIND, EXPRESS OR IMPLIED, OTHER THAN THAT EXPRESSLY SET FORTH HEREIN. NO REPRESENTATIVE OF FLEXCON IS AUTHORIZED TO GIVE OR MAKE ANY OTHER REPRESENTATION OR WARRANTY OR MODIFY THIS WARRANTY IN ANY WAY EXCEPT IN A WRITTEN AMENDMENT OF THESE TERMS SIGNED BY A DULY AUTHORIZED REPRESENTATIVE OF FLEXCON WHICH MAKES SPECIFIC REFERENCE TO THESE TERMS. WITHOUT LIMITING THE GENERALITY OF THE FOREGOING, NO IMPLIED WARRANTY OF MERCHANTABILITY, NO IMPLIED WARRANTY OF FITNESS FOR ANY PARTICULAR PURPOSE, NO IMPLIED WARRANTY OF TITLE OR NONINFRINGEMENT AND NO IMPLIED WARRANTY ARISING BY USAGE OF TRADE, COURSE OF DEALING OR COURSE OF PERFORMANCE IS GIVEN OR MADE BY FLEXCON OR SHALL ARISE BY OR IN CONNECTION WITH ANY SALE OR PROVISION OF PRODUCTS BY FLEXCON, OR BUYER'S USE OF ANY PRODUCTS, OR FLEXCON'S AND/OR BUYER'S CONDUCT IN RELATION THERETO OR TO EACH OTHER, AND IN NO EVENT SHALL FLEXCON HAVE ANY LIABILITY OR OBLIGATION WHATSOEVER UNDER OR IN CONNECTION WITH ANY SUCH WARRANTY WITH RESPECT TO ANY PRODUCTS. Unless specifically agreed to in writing by a duly authorized representative of FLEXcon, FLEXcon’s Products have not been tested or otherwise certified by FLEXcon as fit for use, and are not meant to be foolproof or fault-tolerant, in applications (e.g., nuclear, aerospace, mobile vehicles, medical devices or equipment, weapons systems) in which the failure of the Products could lead directly or indirectly to death, personal injury, or severe physical or environmental damage (“High Risk Applications”). Accordingly, FLEXcon specifically disclaims any express or implied warranty, including, without limitation, any warranty of merchantability or fitness for particular purpose for High Risk Applications. Buyer agrees that FLEXcon will not be liable for any claims or damages arising from the use of the Products in any High Risk Applications and Buyer shall indemnify FLEXcon from any third party claims arising out of or related to FLEXcon’s Products being incorporated into any High Risk Applications. Unless specifically agreed to in writing by a duly authorized representative of FLEXcon, FLEXcon disclaims compliance with any Federal Acquisition Regulations or Federal Drug Administration regulations with respect to the sale of the Products. FLEXcon also specifically disclaims any compliance with any record retention or notification standards or mandates. Buyer acknowledges that no guarantees or assurances have been made as to the results that may be obtained from the use of the Products sold whether used singly or in combination with other materials, items or products. Buyer acknowledges that no guarantees or assurances have been made as to the method by which Products are manufactured, or any follow-on obligations such as record retention or notice requirements. Buyer acknowledges that it does not rely on, and waives any claim relating to, any recommendation or instruction given to Buyer by FLEXcon or any of its representatives regarding the specifications, storage, handling or use of Products purchased and sold by FLEXcon, which recommendation or instruction shall be followed or acted upon by Buyer entirely at Buyer's own risk. FLEXCON'S LIABILITY, AND BUYER'S EXCLUSIVE REMEDY, IN CONNECTION WITH THE SALE OR USE OF PRODUCTS SOLD HEREUNDER (WHETHER BASED ON CONTRACT, TORT, STRICT LIABILTIY, NEGLIGENCE, BREACH OF WARRANTY OR OTHERWISE), SHALL BE STRICTLY LIMITED TO FLEXCON'S OBLIGATIONS AS SPECIFICALLY AND EXPRESSLY PROVIDED IN THE LIMITED WARRANTY SET FORTH IN THESE TERMS. EXCEPT AS SPECIFICALLY PROVIDED IN SUCH LIMITED WARRANTY, FLEXCON SHALL HAVE NO LIABILITY, OBLIGATION OR RESPONSIBILITY OF ANY KIND, IN ANY WAY OR TO ANY EXTENT FOR ANY LOSSES, EXPENSES, COSTS, DAMAGES OR LIABILITIES FOR ANY REPRESENTATION OR WARRANTY OF ANY KIND WITH RESPECT TO THE PRODUCTS (OR THE PERFORMANCE THEREOF), OR ARISING IN ANY WAY OR IN CONNECTION WITH THE PURCHASE BY OR USE OR SALE OF THE PRODUCTS BY BUYER, EVEN IF FLEXCON HAS BEEN ADVISED OF THE POSSIBILITY OF SUCH DAMAGES. IN NO EVENT WHATSOEVER SHALL FLEXCON HAVE ANY LIABILITY, OBLIGATION OR RESPONSIBILITY FOR ANY INDIRECT, INCIDENTAL, CONSEQUENTIAL, SPECIAL, OR EXEMPLARY DAMAGES ARISING IN ANY WAY IN CONNECTION WITH THE PRODUCTS OR THEIR SALE OR USE, INCLUDING BUT NOT LIMITED TO DAMAGE TO PROPERTY, INJURY TO PERSONS, LOSS OF USE OF THE PRODUCTS OR ANY ITEM WITH WHICH SUCH PRODUCTS ARE USED, LOST PROFITS, OR DELAYS OR INCONVENIENCE. IN NO EVENT WHATSOEVER SHALL FLEXCON HAVE ANY LIABILITY TO BUYER, ARISING OUT OF OR IN CONNECTION WITH THE SALE OR USE OF THE PRODUCTS SOLD HEREUNDER, THE TRANSACTIONS CONTEMPLATED HEREBY, OR FLEXCON'S OR BUYER'S CONDUCT OR ACTIONS IN RELATION TO ANY OF THE SAME OR TO EACH OTHER, IN AN AMOUNT IN EXCESS OF, AND FLEXCON'S LIABILITY SHALL BE STRICTLY LIMITED TO, THE AMOUNT(S) ACTUALLY RECEIVED BY FLEXCON FROM BUYER AS PURCHASE PRICE FOR THE PRODUCTS WHICH GIVE RISE TO FLEXCON'S LIABILITY. Buyer agrees to indemnify, hold harmless and defend FLEXcon (and its employees, subsidiaries, affiliates, successors and agents) from and against any and all judgments, liabilities, damages, losses, expenses and costs (including, but not limited to, court costs and attorneys' fees) incurred or suffered by FLEXcon, which relate to or arise out of (a) Buyer's use, handling, installation, removal, sale or distribution of the Products; (b) Buyer's breach of any representation, warranty or obligation set forth in these Terms; (c) the infringement or violation of any third party's intellectual property or other rights arising out of or in connection with FLEXcon's use of Buyer Materials or specifications provided to FLEXcon by Buyer; and/or (d) any negligence or intentional misconduct by Buyer (or its employees, agents or representatives). FLEXcon shall not be deemed to have waived any provision hereof, or any breach by Buyer of any provision hereof, unless such waiver is specifically set forth in writing and executed by an authorized representative of FLEXcon. No waiver by FLEXcon of any provision hereof or any breach by Buyer of these Terms shall constitute a waiver of such provision on any other occasion or a waiver of any other breach by Buyer. Buyer acknowledges and agrees that an alleged waiver of any provision hereof purported to arise from FLEXcon’s receipt of payment or acceptance of Buyer’s purchase order is not valid or enforceable. In no event shall FLEXcon have any liability to Buyer for any delayed performance or nonperformance by FLEXcon which results, in whole or in part, directly or indirectly, from any cause beyond the reasonable control of FLEXcon. Such causes shall include (but shall not be limited to) acts of God, wars, riots, civil disturbances, strikes, labor disputes, fires, storms, floods, earthquakes, natural disasters, inability to obtain or use raw or component material or parts, labor, equipment, facilities, or transportation, inability for technical reasons to produce any Products or to produce any Products with any consistency and acts of any government or agency thereof. Buyer's order will be deemed suspended for so long as any such cause prevents or delays FLEXcon's performance. In the event of any such suspension, FLEXcon shall have the right, at its option, upon notice to Buyer, (a) to terminate its obligation to sell any or all of the Products ordered from FLEXcon or (b) to resume performance as soon as practicable after the suspension, and reschedule delivery of the Products ordered to one or more deferred dates to be mutually agreed upon by Buyer and FLEXcon, subject to Buyer's payment of any additional charge for any increase in FLEXcon's direct or indirect costs occasioned by the suspension of its performance. These Terms and the transactions contemplated hereby shall be governed by, and construed and enforced in accordance with, the laws of the Commonwealth of Massachusetts without regard to its conflicts of law rules that might direct the application of the laws of any other jurisdiction. Any and all disputes arising under or in connection with purchase and sale of the Products, including, without limitation, Buyer’s purchase order, the Acknowledgement, invoice or Terms shall be resolved exclusively in the state or federal courts of the Commonwealth of Massachusetts and Buyer expressly agrees not to challenge the jurisdiction or venue of such courts on any grounds and agrees to accept service of process by mail at the address indicated for Buyer in the Acknowledgement. Buyer and FLEXcon agree that The United Nations Convention on Contracts for the International Sale of Goods will be expressly excluded from the choice of applicable law and will not apply to the purchase and sale of the Products, including, without limitation, Buyer’s purchase order, the Acknowledgement, invoice or Terms. These Terms may not be amended except by written agreement signed by a duly authorized representative of FLEXcon and Buyer expressly referring hereto. Buyer's rights and obligations set forth in these Terms may not be assigned or otherwise transferred without FLEXcon's express prior written consent. All communications under these Terms shall be in writing or by confirmed email, and shall be deemed to have been duly given (a) upon personal delivery, (b) upon deposit in the mail if mailed by certified mail, return receipt requested, postage prepaid, (c) upon deposit with a recognized courier with next-day delivery instructions, or (d) upon confirmation of transmission, if sent by confirmed email, to the address set forth in the Acknowledgement or such other address as either party may specify by notice sent in accordance with this Section. Nothing contained in these Terms shall be deemed to constitute either party as the agent or representative of the other party, or create a joint venture or partnership for any purpose.